MediaFire was founded by a group of entrepreneurs and website enthusiasts who searched for solution to tackle the troublesome process of large file sharing over FTP and email. MediaFire started from Bay Area, San Francisco on August 2006. They focused to deliver simplest file hosting and storage service to the world for sharing documents and images. Mediafire launched their first version on October 2006, since then they have launched several version with improve results. MediaFire has become one of the priority storage solution worldwide assisting people to easily store, manage and share data via Internet. They also offer 50 GB on their free account to store digital material and share it with friends, family and colleagues. MediaFire paid storage starts for just $ 9.00 per month with 250 GB space and additional operational functions. These applications include analytics, banding tools and multi-seat employee account are designed to facilitate Professionals and Businesses. MediaFire is currently based north of Houston, in The Woodland of Texas state. 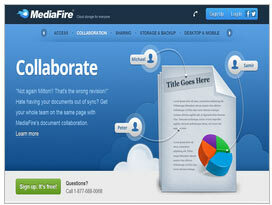 Staffs at MediaFire are drived on working with innovative and interesting projects. They are not just storage providers but it also comprises of a dedicated group of desktop software and web based application developers. Their development team helps in achieving their goal to improve online file sharing experience. @sviundt Hey Thomas, thanks for reaching out, social login is temporarily down but we're working on it. Should be back soon!